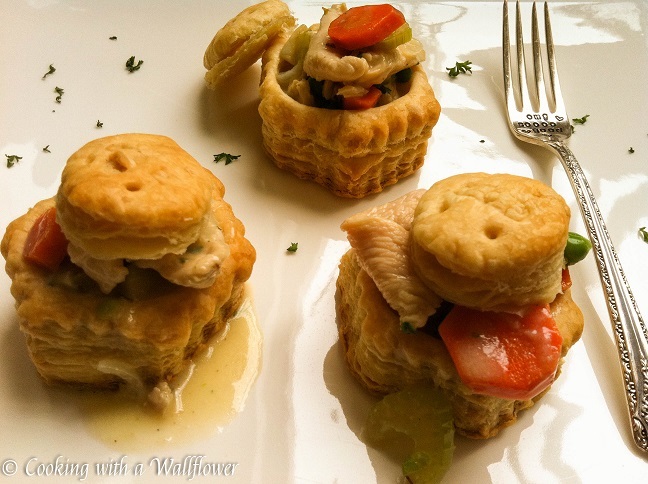 Chicken pot pie loaded with tender chicken and vegetables in delicious puff pastries. 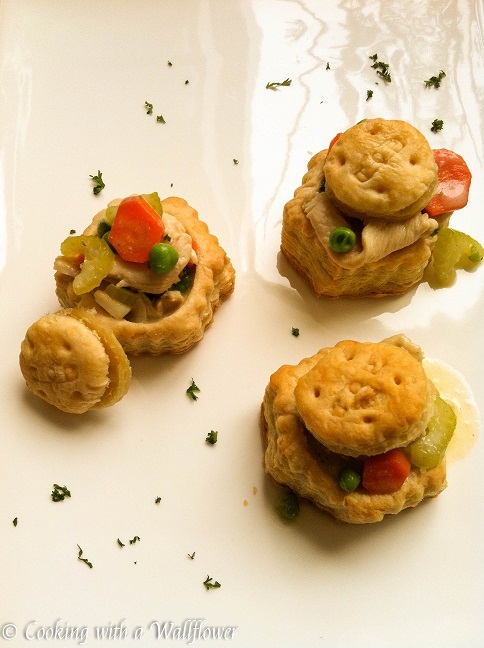 Served in small individual sizes, these chicken pot pie puff pastries are perfect as appetizers. Oh, oh, oh! 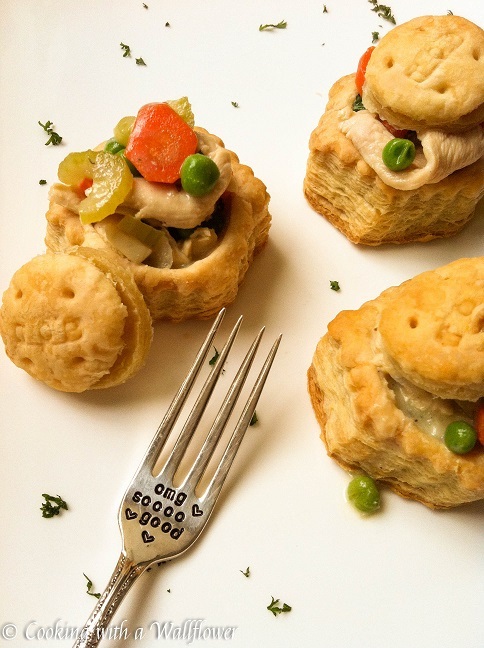 I’m soo excited about these chicken pot pie puff pastries! I really, really hope you still have room on your Thanksgiving menu for one more recipe! Chicken pot pies are one of my absolute favorites growing up. But we always had the Marie Callender frozen ones or the ready to serve KFC ones. It’s not until recent years, um, make that within the last year, that I began creating my own version of chicken pot pie. Who knew these little pot pies were that easy to make? Or that I could customize the ingredients to my own liking? Can you picture tender juicy chicken with sweet carrots, parsnips, peas, onions, garlic, and celery in almost every single bite? Seasoned with thyme, nutmeg, and a bit of salt, this chicken pot pie tastes amazingly delish and savory. I’m pretty sure someone can fit all that in one bite, but it’ll be one gigantic bite. As much as I wish I’m a fantastic baker, I’m definitely not. Recipe fails happen all the time when it comes to baking. So to make my life hassle free while I’m planning the rest of dinner for Thanksgiving or any other gathering, I used Pepperidge Farms’ Puff Pastries. And if you want to try making homemade puff pastries, Christina from Dessert for Two has a recipe for 15 Minute Puff Pastry. Layers of flaky puff pastries filled with tender chicken and tons of vegetable, this chicken pot pie puff pastry is the perfect appetizer. Or meal. I might have had two, maybe three. I lost count. I’ll be bringing these to Fiesta Friday. Add vegetable oil to a medium sized pot over low heat and allow it warm up for about a minute. Next, add in the minced garlic and cook them until they begin to turn a golden brown. Keep watch on the garlic and constantly move the garlic with a spatula to make sure that they don’t become burnt. Add in the sliced onions, and cook them until they’ve softened. It’s important to add the vegetables that take longer to soften first. In other words, the carrots, the parsnip, and the celery. Add these into the pot and cook them for a few minutes until they’ve become soft. Pour half of the chicken broth into the pot, allowing the ingredients to simmer over medium heat. You want to make sure that the vegetables are to the texture of your liking. I usually like my vegetables crisp, but in a pot pie? I prefer them to be soft. Try the vegetables as you cook them to see if the texture is to your liking. Once the vegetables are to your liking, add the sliced chicken. You want to add chicken towards the end, that way you won’t overcook the chicken. Sliced chicken is thin so it won’t take long to cook. Mix together the flour and the rest of the chicken broth until the flour dissolves. This will create the thickener. Pour the mixture into the pot, and stir as you slowly pour to make sure that flour is evenly incorporated. Add the peas. You want to add the peas at the end because if peas are overcooked they lose their vibrant fresh green color and turn a dull green. Lastly, pour the milk into the pot. Milk can sometimes curdle if you cook them for too long or if it’s too hot, which is why I like to add milk at the very end. If you want your chicken pot pie to be creamier, you can use half and half or heavy whipping cream instead, but I used 2% low fat milk and it’s perfect for me. While your chicken pot pie filling is cooking on the stove, you can preheat the oven to 350F. Remove the puff pastries from the packaging, and place them on a baking sheet. Place the baking sheet into the oven and bake them for about 18-20 minutes until they’ve puffed up and turn golden brown. Allow the puff pastries to cool for a few minutes and remove the top. 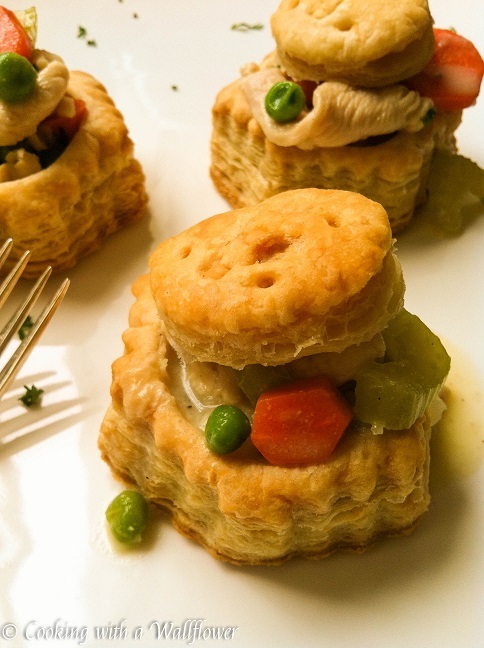 Spoon the chicken pot pie filling into each puff pastry. Serve the puff pastries warm. Add the vegetable oil to a medium sized pot over low heat, allowing the oil to warm for about a minute. Next, add the minced garlic to the oil. Cook the garlic until it turns golden brown on the edges. Add the sliced onions, diced carrots, parsnips, and celery, and cook them until they have softened. Use a spatula to stir them to cook them evenly. Once the vegetables have softened, pour in half the chicken broth, then add thyme, nutmeg, and salt. 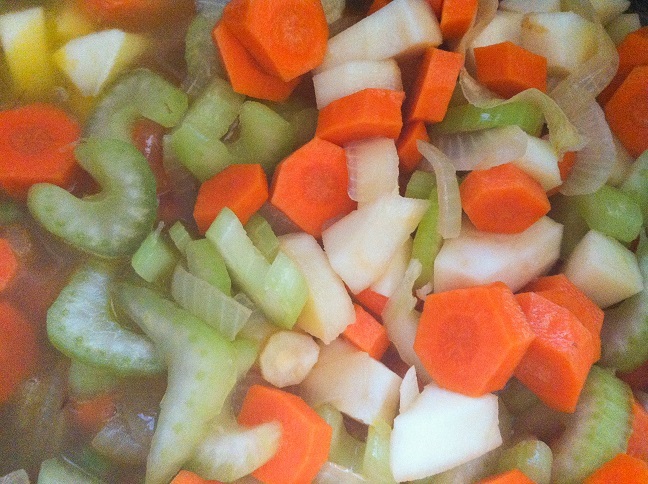 Allow the carrots, parsnips, and celery to simmer for several minutes. Try the vegetables to see if the texture is to your liking. Adjust the seasoning as needed. Add sliced chicken to the pot. Whisk together flour with the reserved chicken broth until the flour has completely dissolved. This will act as a thickener for the broth. Slowly pour the chicken broth and flour mixture into the pot, stirring as you pour to make sure that the mixture is evenly incorporated to create a gravy consistency. Add the peas at the end so that they appear a bright vibrant green. Allow them to cook for about 5 minutes. Lastly, pour the milk into the pot and stir to evenly incorporate the milk. 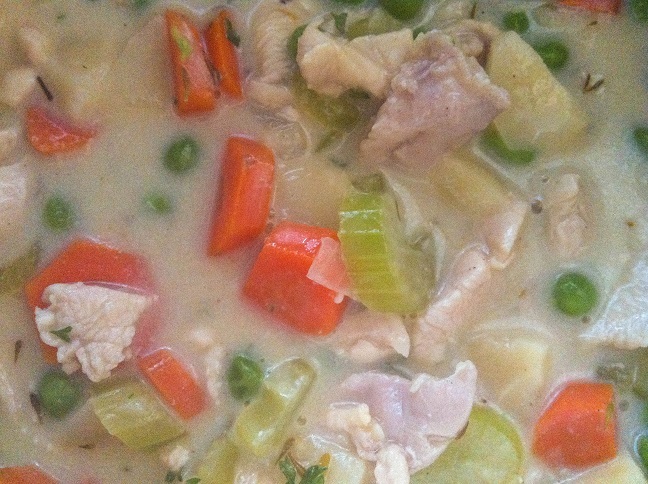 Allow the chicken pot pie filling to simmer for a few minutes. While the chicken pot pie filling is simmering, preheat the oven to 350F. Remove the puff pastries from the packaging and separate them. 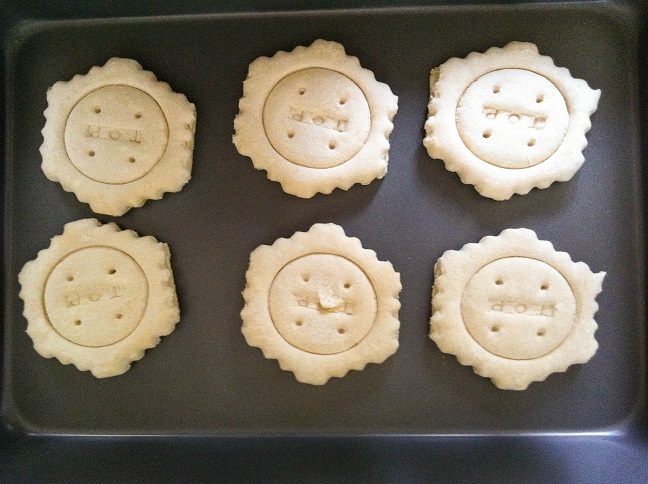 Place them onto a baking sheet. There’s no need to grease the baking sheet. Place the puff pastries into the oven and bake them for about 18-20 minutes or until they’ve puffed up and become golden brown. Allow the puff pastries to cool for a few minutes before removing the top. Spoon the chicken pot pie filling into the puff pastries. 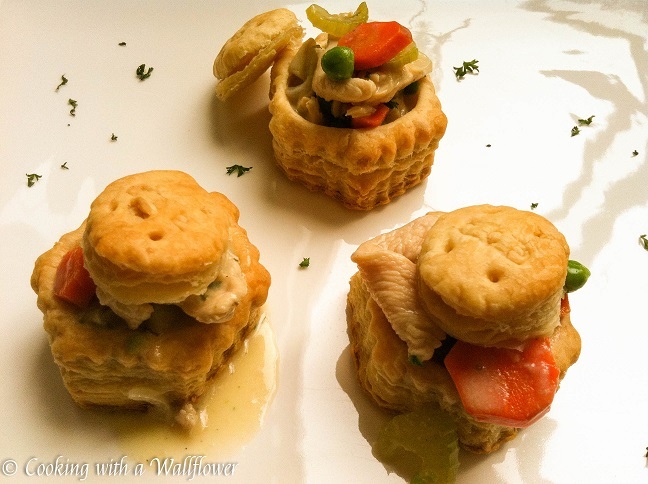 Serve the chicken pot pie puff pastries warm. 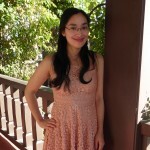 This entry was posted in Appetizers, Entree, Holidays, Quick and Easy, Recipes and tagged appetizers, puff pastries, quick and easy, recipes. They look so cute. Maybe I will try them someday.